Compatible amps include Vox® AC50CPH,AC100CPH, AC30CC, Peavey® Nashville 112, Fender® Hot Rod Deluxe/Deville, plus others. 3 answers I'm guessing it is, but is this the one to get for a blues deville 410 from 1994? Yes if you have an original 90's Blues Deville you can use any tank with BB as the second and third character. The original Blues Deville takes a 4BB3C1B and the reissue takes a 4EB3C1B. 2 answers What should my ohm meter read on a 9EB2C1B? Is this the right tank for a Peavey Stereo Chorus 400? The input should read 800 ohms and the output 2,575 ohms. We are not sure if this is the correct replacement for a Peavey Chorus 400. 1 answers Hi, this tank is compatible with Peavey Classic 30 amps, correct? From doing a quick internet search, it seem that the Classic 30 uses a 4eb2c1b. The 9eb2c1b is the 3 spring version of this tank. This should work in your amp. Hi, if the eight character number is the same then you should be fine. 1 answers Hi, this tank is compatible with Carvin Nomad 50? 1 answers Will this reverb tank work in a Mesa Boogie Mark V Head? Your tank should have a series of characters such as 9EB2C1B. From our limited research it appears that the Mark series uses a 9AB2A1B. I would confirm this by looking at your tank. 1 answers I need to replace a PRVL3EB2C1B (Ruby, Long 3 Spring) reverb in a VOX AC50PC2. Is this unit a direct replacement? 1 answers Will this tank work in a Fender DRRI? No, you need a 4AB3C1B. 1 answers Will this work for a Peavey Studio Pro 112 65 watt? We are unsure if this is the right tank for your amp. You may want to contact Peavey directly for more information. As long as your original tank as EB as the second and third character then this tank should work and will give you a more intense reverb. From our brief research it appears your amp came stock with a 8AC2A1B. With that in mind, this tank is not compatible wit your amp. 1 answers Where is this made? All Accutronic tanks are made in South Korea. 1 answers Hi, will this tank work with a peavy valveking 112? It looks like the original tank in the Valveking is an 8EB2C1B. This is the same tank but longer (16.75"). If you have the room this should be compatible. 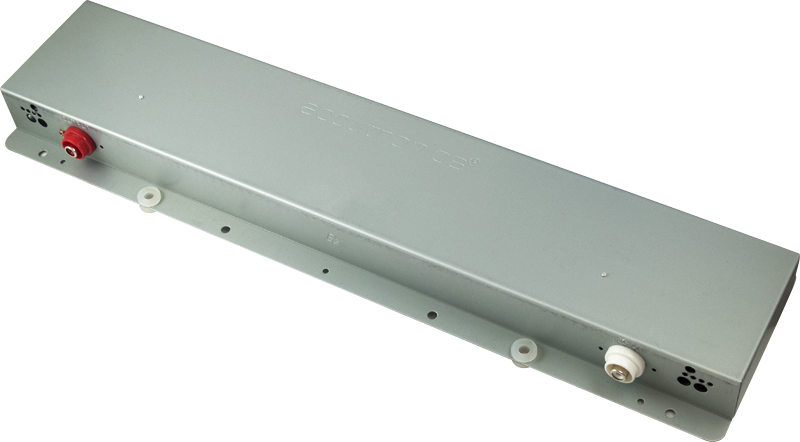 1 answers Hi, The type 9 series is listed on accutronics' site as a 6 spring unit. Is this a 3 spring or 6 spring unit? The 9 series tanks have 3 springs. 1 answers Will this pan work in a Peavey Nashville 1000? We do not have any information on the Nashville 1000 but if it is anything like the other Nashville models then it should be compatible. 1 answers Will this work in a Vox AC30CC2? This is the designated tank for the Vox AC30CC, but we are unable to verify it is the correct replacement for a AC30CC2. If your amp has an input impedance of 800 Ohms and an output impedance of 2575 Ohms, this should work for your amp. 1 answers hola. podria usar el tanque nº 9EB2C1B en un amplificador Traynor YCV80? We do not have specs on the tank that was used in that particular am, but Traynor claims that the YCV80 came with a two spring tank, and this tank has three, so it is not the direct replacement. 1 answers Does this tank work with a Genz Benz el diablo 50/100 combo? If not what tank do i need? We do not have cross reference materials to be able to provide you with a tank number used in those amps. We suggest you take the original tank out of the amp, visually inspect it, and see if there is a model number you can work with. 0 answers This part number is exact match for my Peavey Stereo Chorus 400.